For a day last week, I spoke nothing. A significant thing yielded is control. When we don’t speak we let go of the presumed need to defend ourselves to…ourselves, the universe, God, or others. 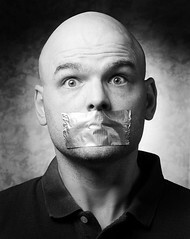 Controlling the uncomfortable ness of silence is simply done by speaking. There’s a scene in Life where the main character, Charile Crews, is telling a suspect about what solitary confinement in jail was like: ”The first six months I didn’t talk to myself. I did push-ups, you name it, but I didn’t talk to myself. The next six months…I started talking to myself. And the next six months after that, well, you don’t want know what that’s like.” Six months in isolation without a word. Imagine it. But sooner or later in order to not lose control of his sanity, he speaks, even if it is to himself. And it’s probably not much different than why the presumed “crazy” street person talking in fights with himself – both are trying to control the demons that come if words aren’t spoken to stave them off. As I went on with the day of not speaking, I had to go to the library to pick up some books. Walking the eight blocks downtown I dodged any possible interaction with another human simply to maintain the quiet. Speechless in isolation is one thing, but speechless amidst others is almost impossible. Lucky for me, nobody talks at Libraries. But it took some conscious efforts to not even say the passing “hello” to strangers, a normal courtesy especially for someone like me from Texas. When the Rabbis debate what God said on the mountain to Moshe, some say that the only thing God said was his Name. And that Name sounded like…breathing. Maybe that is why so many mountains take our breath away. If you have ever been on top of one, the last thing you do is talk, because there just aren’t words. Something my day of speechlessness taught me was that I don’t need to be on top of a mountain to be caught by the beauty of life around me, I just have to be quiet enough to notice it. And it hopefully helps me listen to what is happening in another person’s life right before my eyes, and not cluttered with my words. Sometimes the life I start hearing is my own. Mr. Buechner might be right that the silence says too much, but it sure does make a difference when we listen…not adding to it.